Whether you use your sheepskin pelt as a rug, runner or furniture throw, this durable, natural fiber accents styles ranging from rustic to retro. The long fibers of supple sheepskin lend it its plush softness and lush look, but these dense strands also collect odors over time. Fortunately, genuine sheepskin is a low-maintenance decor option -- for day-to-day smells, you won't likely need to make a trip to the dry cleaner. Remove loose particles -- such as potentially odorous bits of food or debris tracked in by pets -- by vacuuming your sheepskin with a plain-suction vacuum cleaner. Do not use a vacuum with a revolving brush, as this may damage your sheepskin. Spot-clean foul-smelling stains with a damp, clean cloth and a mild detergent, blotting the trouble spots with a mixture of detergent and water, then dabbing or rinsing with plain water to flush out detergent residue. Use only cold water and a mild household detergent, such as hand soap or shampoo. Do not use laundry soap, bleach, fabric softeners or alkaline cleaners. 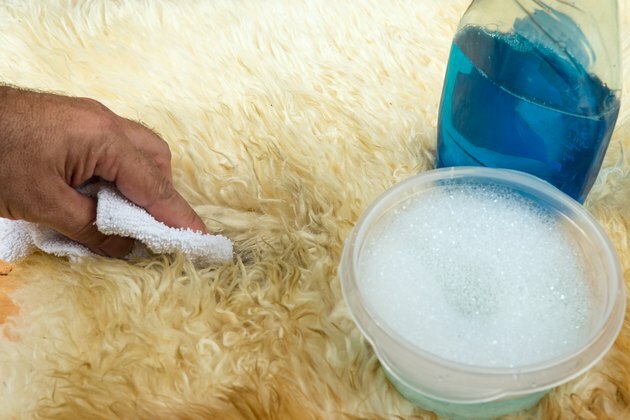 Machine wash your sheepskin on a gentle or wool wash cycle in warm water -- no more than 104 degrees Fahrenheit -- with mild household detergent to wash away worn-in odors. Do not machine-wash your sheepskin if it features backing material or if the manufacturer warns against it. 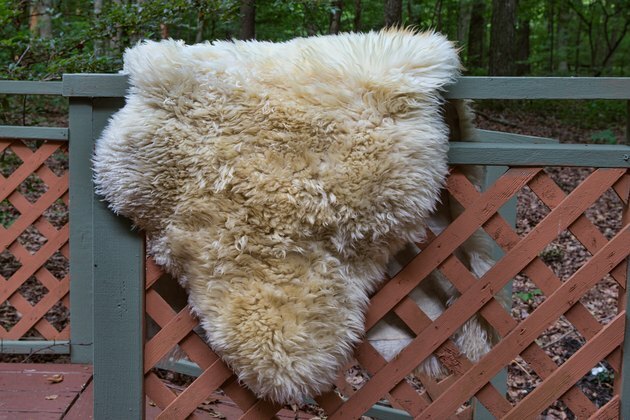 Air-dry your sheepskin outdoors, laying it flat or draping it over a clothes line, until it dries completely. Choose a breezy area that does not receive direct sunlight, as the sun may fade or discolor sheepskin. Gently stretch out draped sheepskin as it dries to help it keep its shape. 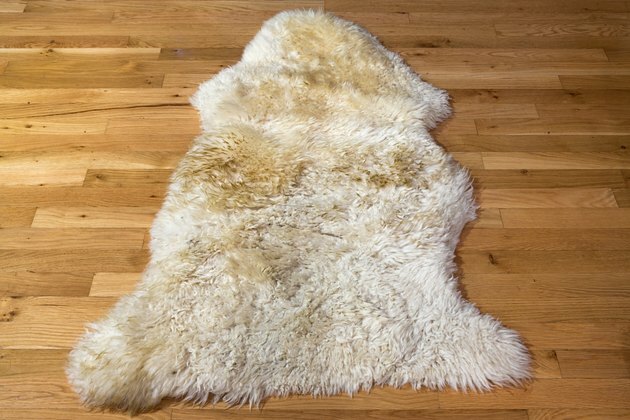 You can also air out sheepskin that you haven't washed to help release odors, especially the distinct scent of newly purchased sheepskin. 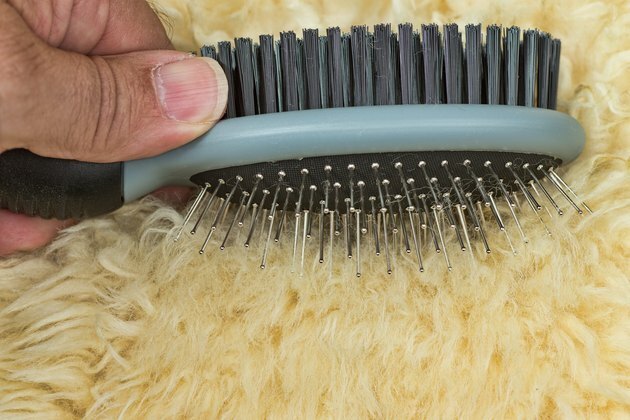 Brush longer-haired, unshorn sheepskin with a wire pet brush to free it of dirt and debris. If you have hand- or machine-washed it, give the sheepskin a thorough brushing while it's wet to remove stinky crumbs and another brushing while dry to fluff up the fur. Do not brush shorn sheepskin, such as shearling, while it is wet or damp.